From amazing grilled pizza to superfast crostini, here are seven ways to take advantage of delicious late-summer figs. This delicious grilled pizza is topped with creamy gorgonzola and sweet fig chunks. 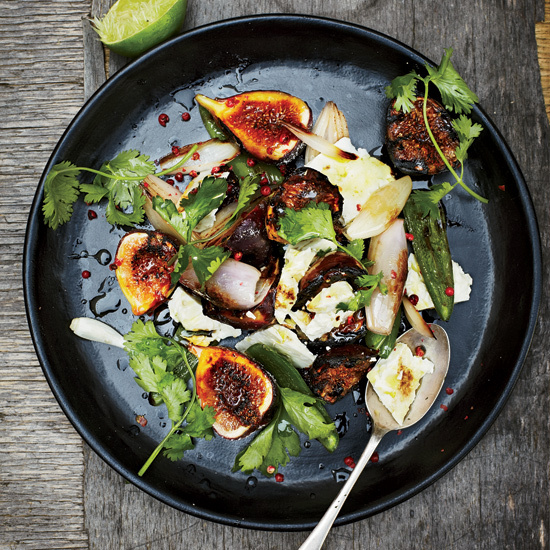 Chef Tim Byres's healthy salad combines plump, juicy grilled figs and a quick fig jam. Or try this sweet-savory summer fruit salad with ripe green or black figs. Chestnut honey gives this beautiful fig-and-raspberry tart a spicy kick. Have 5 minutes? Top crispy toasted baguette with ricotta, salami and fig. F&W Best New Chef '14 Matthew Accarrino's take on the classic French dessert features juicy fresh black mission figs and port-infused whipped cream. These delicious yogurt-spelt breakfast muffins are swirled with a syrup made from fresh figs and Marsala wine. Or try these tender fig-studded cornbread muffins. "I snagged this dessert from my Scandinavian grandmother," says chef Mehmet Gürs of this fantastic raspberry-and-fig cake. Or make this versatile lemon upside-down cake, which is great with any type of fruit.